Hi everyone! 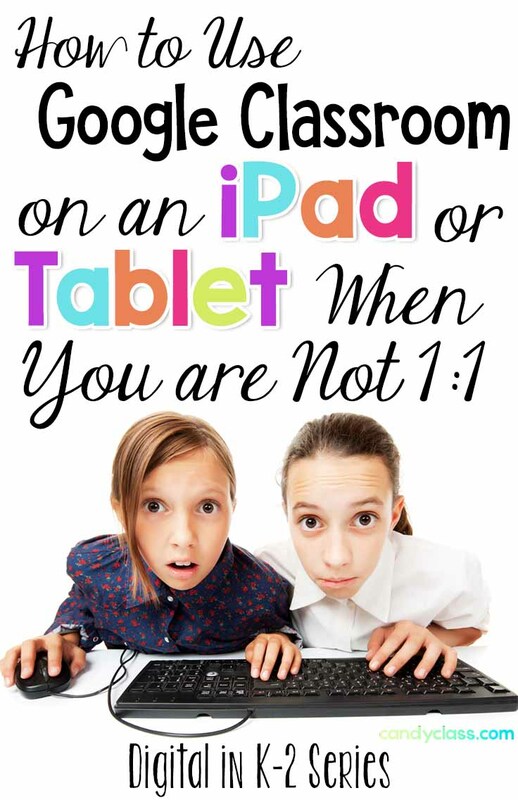 Today, I want to offer show you how to use Google Classroom on an iPad or tablet when you are not 1:1. Some of you may have been 1:1 for a while, but Google Classroom is new to you. Now, some of you might ask, what is 1:1? This is simply when each student has their own tablet or iPad to use in your classroom. Of course, some of you are like, our computers are more like one of those ones from a 1972 sci-fi movie. I can relate. My first year of teaching, I had no printer in my classroom and the text on the only computer was green and ran like a brontosaurus. This was in the 2000s, and it was mainly just my class that had THAT computer. Others had more efficient ones. My classroom was a storage closet with an obvious hidden dinosaur when they gave it to me, haha! Fast forward three years at another district in the county next door where I later went to teach, and they were handing me an interactive whiteboard and telling us to use it without providing very much with content in it or guidance geared for primary teachers. Some of you might not have devices for each student, and that might have some perks of its own, haha! New technology equals more expectations usually. 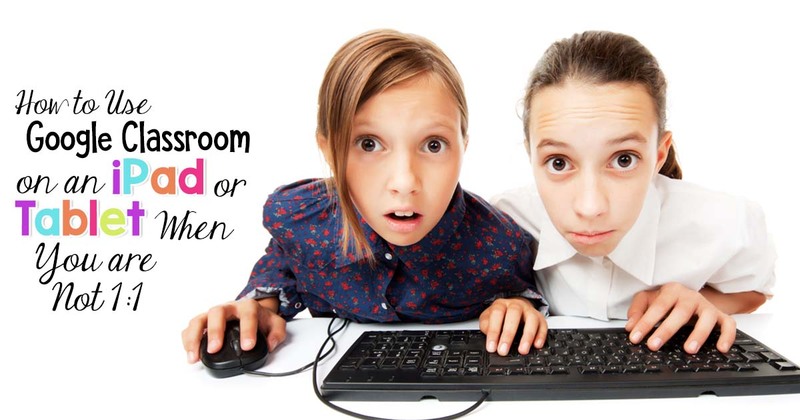 How do you manage using Google Classroom when students have to share the device? I am going to show you how I would do it. There is another option to have students log in and out, but that takes time each go around. Also, sometimes you have no control over the username and passwords given to your students that can easily be hard for them to remember or too easy to make a typo on due to the long length. ELA center time with the gadget could easily become login practice time instead! Thankfully, the devices leave the students logged in on an iPad and lets you add multiple accounts onto the device. This method will show you how to add multiple accounts, so students can select their account to use. 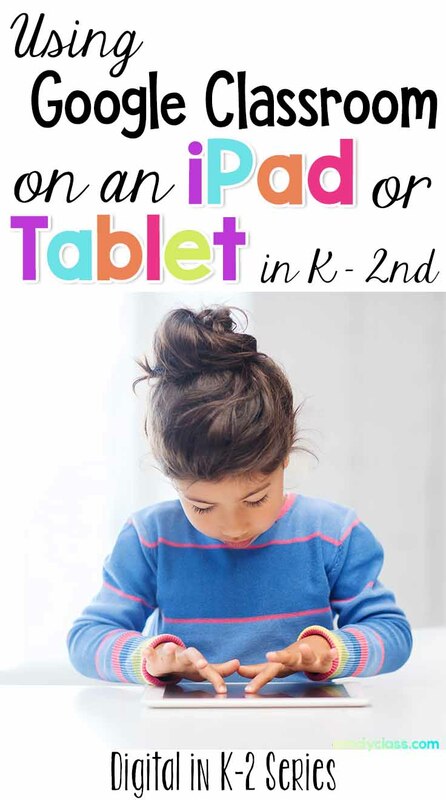 First off, if you do not have Google Classroom on any device, please see this post first on using Google Classroom on an iPad or tablet in a K-2 classroom by clicking here. Then don’t forget to jump back to this post. I have this post linked in there too. I recommend having students assigned a device and planning that out before you set this up. Using some labels to number the device or name it will help manage this. (Students will find funny names amusing!) You will also want to consider when you will be using the devices in groups to make sure that two students assigned to use one device are not suppose to be using it at the same time (unless you want them collaborating, of course). Using your groups as a reference when assigning the devices will help to manage this. Sometimes, you might need to tweak it as you change up your groups, but considering groups when assigning devices is a good way to manage this. Once you know what student will be going on what device, you are ready to jump into adding them on it. 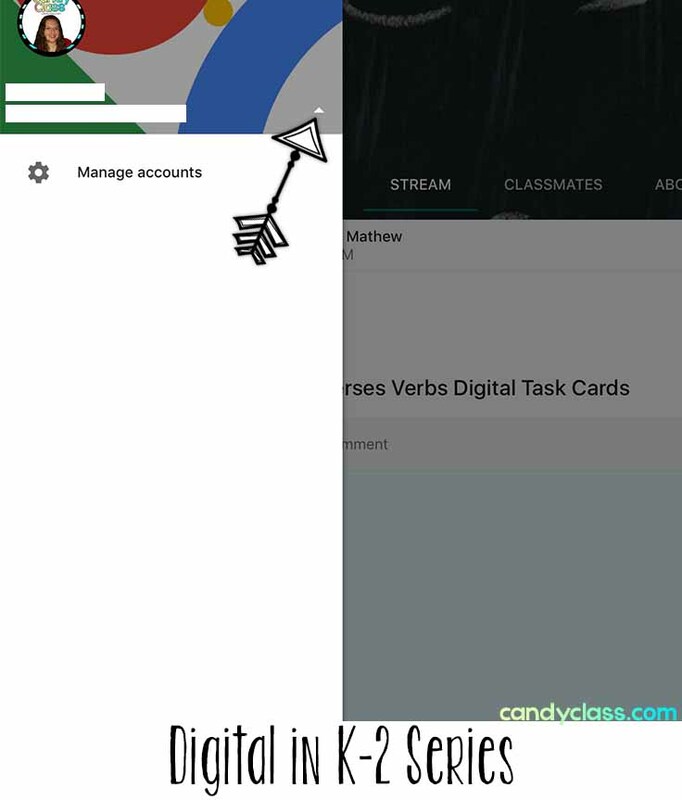 After you have followed the steps from the previous blogpost, you will basically be repeating some of the steps to set-up the accounts for any students using the device. First, go into Google Classroom. On the left, select the bars. You will see the first account you have assigned to the device. Click on the triangle. Choose manage accounts. Select add account. 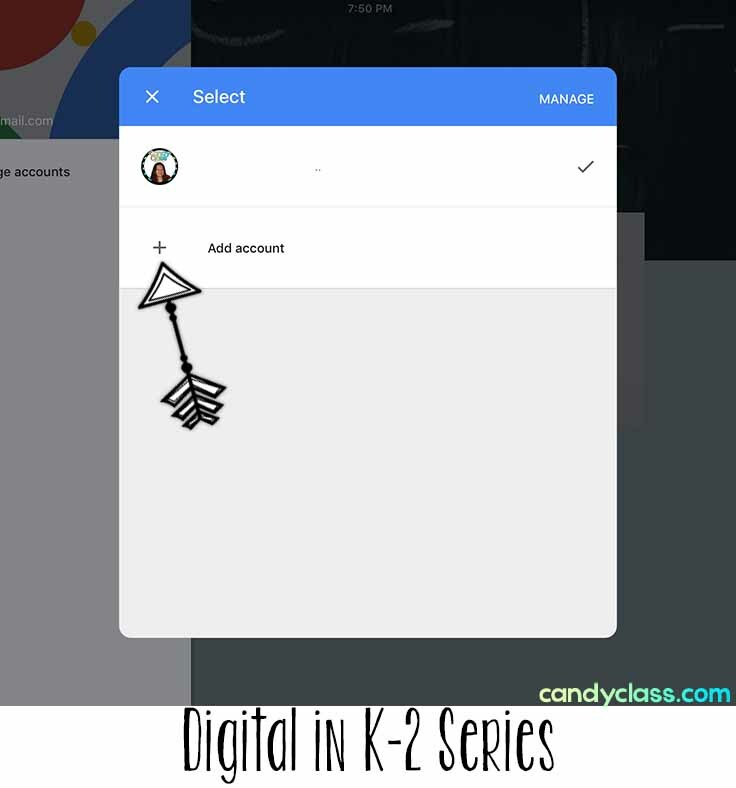 Add the account information to add the student to the device for Google Classroom. 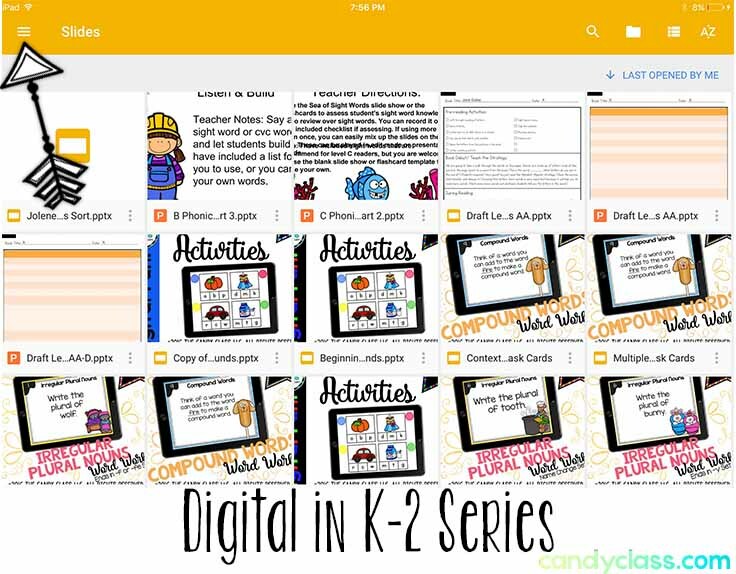 Now, you will need to add the student’s account to the Google Slides app if you will be using resources that have the drag and drop or movable pieces. 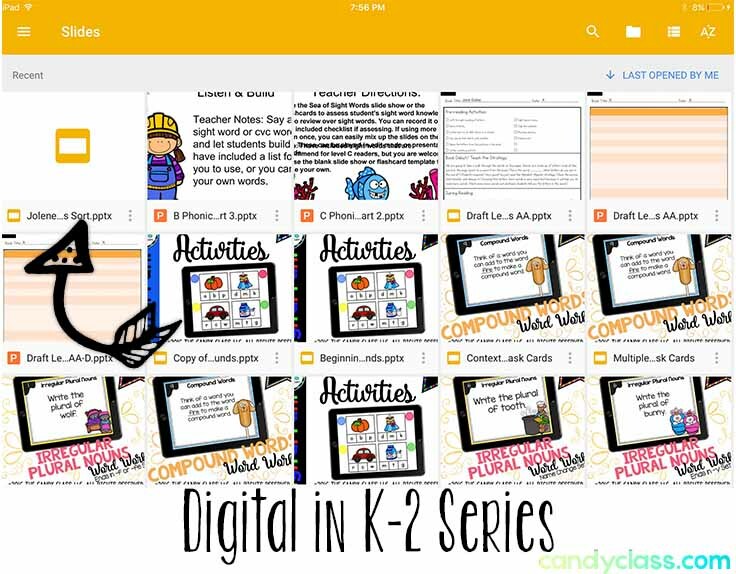 Go to the Google Slides app. Click on the three bars in the top left corner. Click on the arrow. It will look a little different. (Sorry, I forgot to take a picture for that step, and I am having a lazy moment, haha! Please cut me some slack, I work 12 hours a day even in the summer, lol! It is pretty much the same as the one above, only without the choose manage account option). Choose manage accounts once that option appears. Select add account. Add the account information to add the student to the device. Now here is where it gets more complicated because you will have to train your students to do this step. Thankfully, they pick up on things fast! Students will need to know how to select their account in Google Slides to be able to access their file and select their accounts in Google Classroom to turn in their assignment. 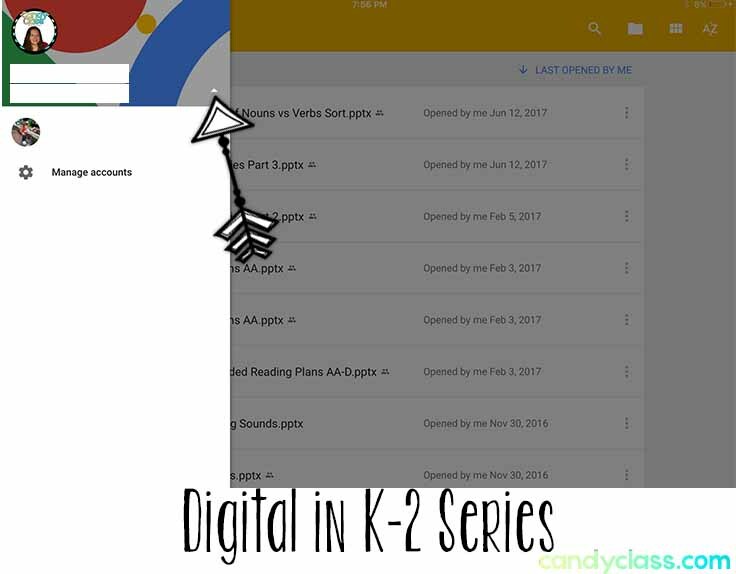 Students can select their file by going into the Google Slides app, selecting the bars, clicking the arrow, and selecting their account as shown in step 2. They will then have access to their files and can select their assignment. It should be the first choice if it was recently added. Now thankfully, when you make a copy for a student in Google Classroom, it puts their name on the front part of the file. That way, they can know it is their file. I recommend teaching them to double check by looking for their name on the file too. 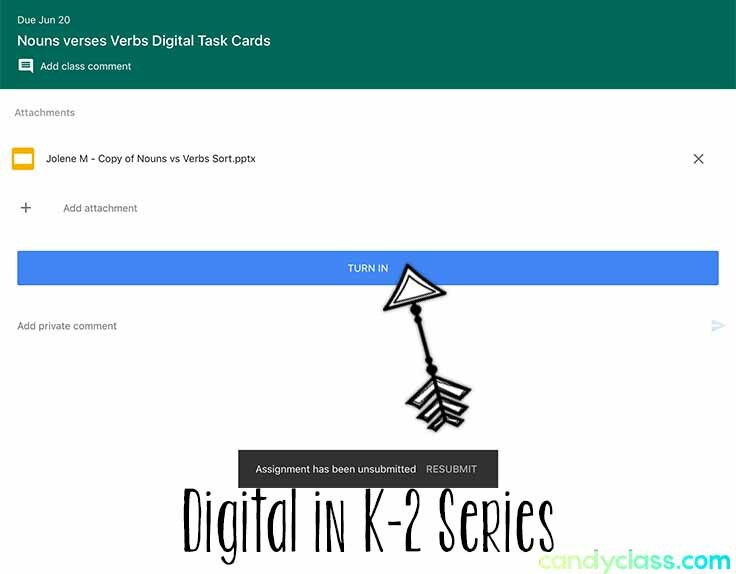 When students work within their file, it will automatically save into what you are able to access from Google Classroom. 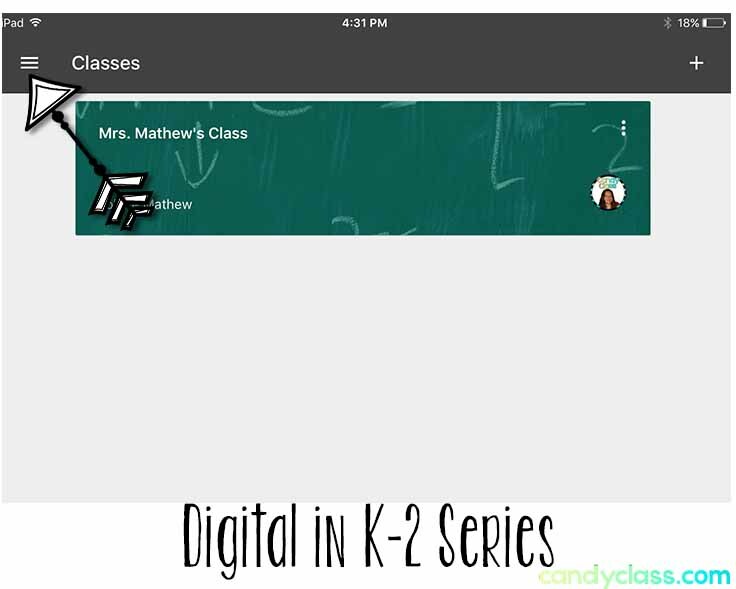 Once students complete an assignment, you will also need teach students how to go into Google Classroom, select their account and turn in the assignment. Once students are in the Google Classroom app, they select the bars, click the arrow, and select their account as shown in step 1. Then they select the assignment and choose turn in. You are then able to view their assignment to assess how they are doing, so you can intervene with students who are struggling with something. Yes, this is not a perfect system because there are some situations that can arise out of this to complicate things. 1:1 makes life a bit easier because it takes away worries of students accidentally working in the wrong file or worst yet…working in the wrong file on purpose. However, many still do not have that luxury! This is pretty much working within the technological limits, so you can have multiple students using Google Classroom on the same device. 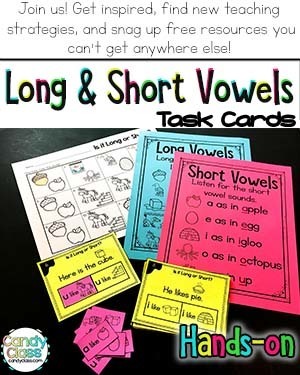 If you are new to my blog, I have a free set of printable task cards for long and short vowels that I would love to share with you. Simply sign-up for email, and they will be sent to your email. If you are a current email subscriber, but you do not have the cards, you can grab them also by filling out the form too. Thanks for stopping by the Candy Class! 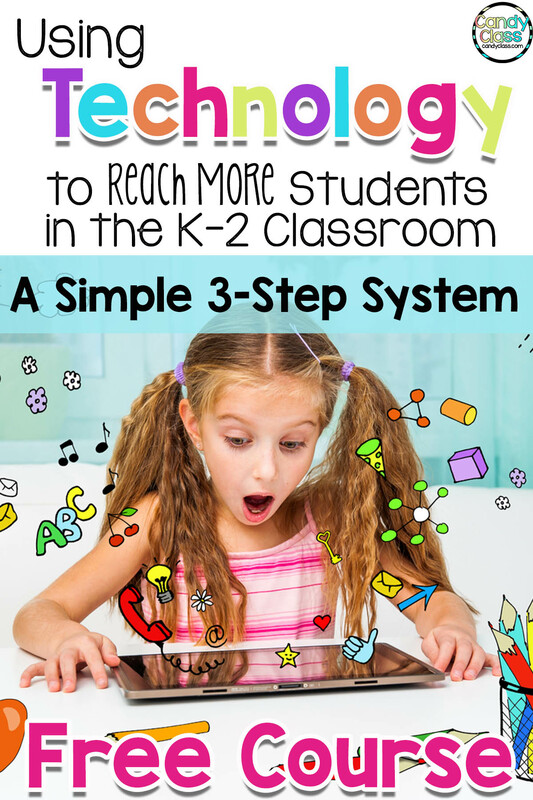 I would love to hear about how you are using technology in the classroom in the comments below.